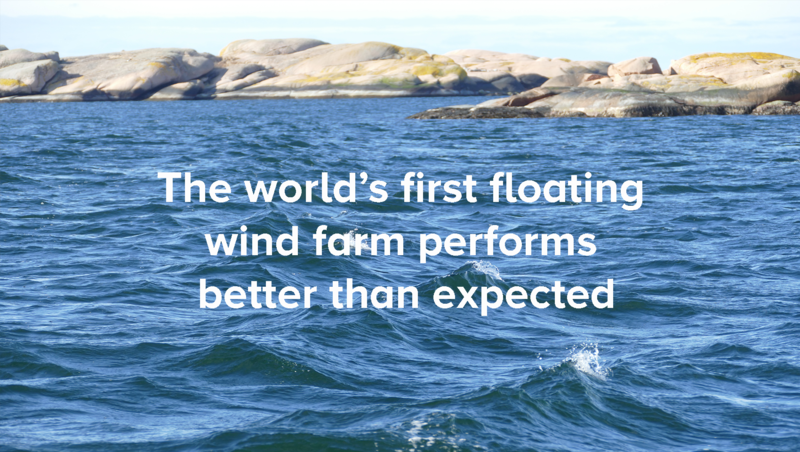 The first floating wind farm in the world performed better than expected during its first three months of operation, according to the owner Statoil who now aims to reduce costs. However, SeaTwirl wind turbines offer even greater opportunities for reduced costs. The world’s first floating wind farm, Hywind off the shore of Scotland, has performed better than expected since its opening, its owner Statoil announced recently. The capacity factor for the farm was 65 percent during the first three months. That is world class performance for offshore wind. The capacity factor measures how much of the theoretical maximum capacity is utilized. No power plant is at 100 percent, not even the “traditional” power plants such as coal and nuclear as they too are shut down for maintenance from time to time. For wind power, wind conditions also become a factor. Usually, bottom fixed offshore wind usually comes in around 45–60 percent, according to Statoil. A level that Hywind surpassed during its first three months. One reason is that the wind resources are better further out at sea. It’s simply windier. When you’re not bound by shallow depths, these natural resources can be better utilized. Since about 80 percent of the global wind resources are in deep waters, Statoil is positive on the future for floating wind power. The SeaTwirl team shares that optimism. Statoil now aims to reduce the cost for the technology bringing Hywind down to 40–60 euro/MWh until 2030, which is seen as an ambitious but realistic target. Optimized design, bigger turbines and bigger farms that provide scale advantages in operations are the improvements that will take them there. – At SeaTwirl we’re delighted by the great results Statoil’s having. It is important for all of us in the floating wind power business that early leaders succeed, says Gabriel Strängberg, CEO of SeaTwirl. – We note that our design is even better suited to reduce costs along the parameters listed by Statoil. Vertical axis turbines can be placed closer together and can be built bigger than horizontal axis turbines. And when it comes to maintenance, our generator housing is clos to the surface as opposed to the nacelle of a horizontal axis turbine, like Hywind, which means that maintenance can be done with smaller ships. We also have a patent for a divisible turbine, which means that the whole generator housing can be replaced and then repaired onshore, says Strängberg. SeaTwirl is now developing a full-scale turbine with a capacity of 1 MW. The launch date is set for 2020 and the ambition is to become a leading player in the floating offshore wind industry.